Sweet and Tangy Pork Kabobs quick, simple, and the perfect last minute summer dinner idea! 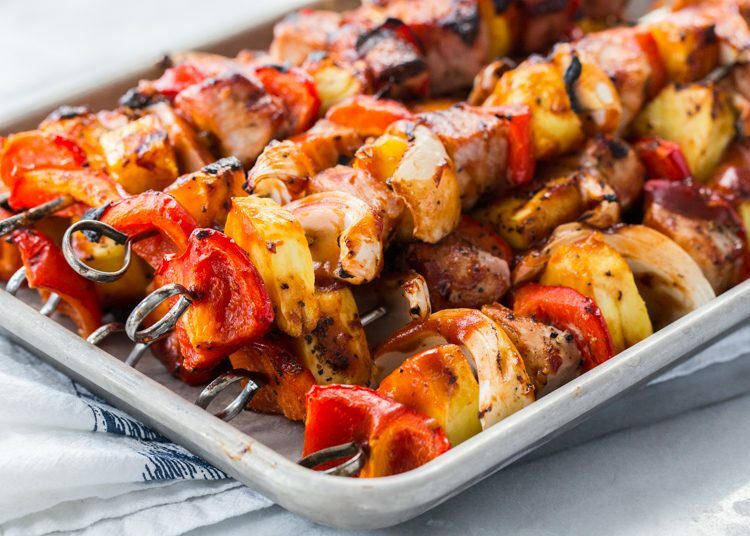 This recipe, Sweet and Tangy Pork Kabobs, is sponsored on behalf of the Ohio Pork Council. All opinions are, as always, my own. I am in the camp of everything tastes better on a stick. Hot dogs, cotton candy, and popsicles are just a few of my favorites. That’s why I love kabobs! It’s like an entire meal all on a stick – or at least cooked on a stick. Today, I’m bringing you my formula for super simple Sweet and Tangy Pork Kabobs. I hesitate to call this a full out recipe because it’s just so simple and ingredients can be swapped out depending on what you have in your fridge or what calls out your name in the produce section. 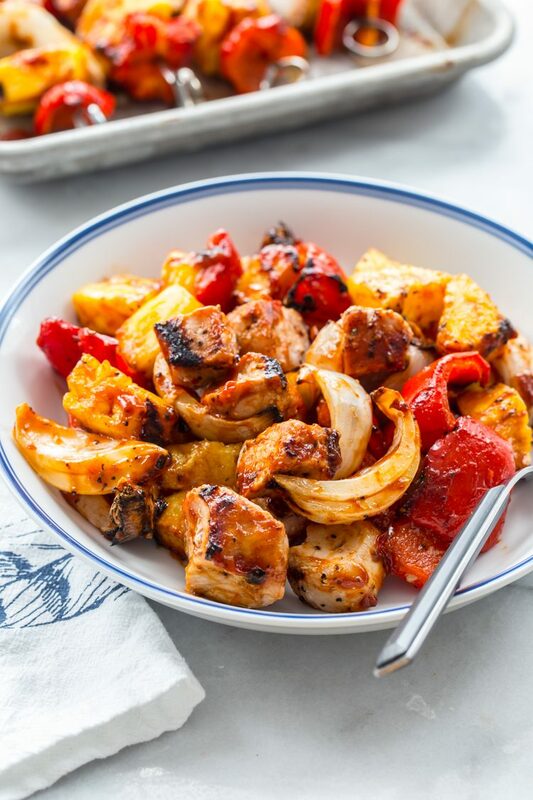 I love choosing pork kabobs because pork pairs so perfectly with this sweet/tangy combo. In this version, I picked up two thick, boneless center cut pork chops and cut them into in inch pieces. Then, the pork gets skewered onto metal skewers (or wooden skewers that you’ve soaked for 30 minutes before using) with sweet bell peppers, juicy pineapple, and fresh onions. Some simple salt and pepper for seasoning and a tangy vinegar sauce (either store bought or homemade) makes this recipe ready to go on the grill in just 15 minutes – 10 if you’re a fast chopper! As I was saying, the great thing about this recipe is it’s adaptability. Try pairing the juicy pork with ripe peaches and zucchini or plums and broccoli. Sounds crazy, but it’s completely delicious! I never want to labor over an elaborate dinner or recipe in the heat of the summer but but putting together a simple meal doesn’t have to be boring. When pork is cooked properly, to a temperature of 145° F with a blush of pink, it’s natural juicy flavor shines alongside seasonal grilled veggies and fruit. Serve the pork and veggies on their own or over a bed of rice. 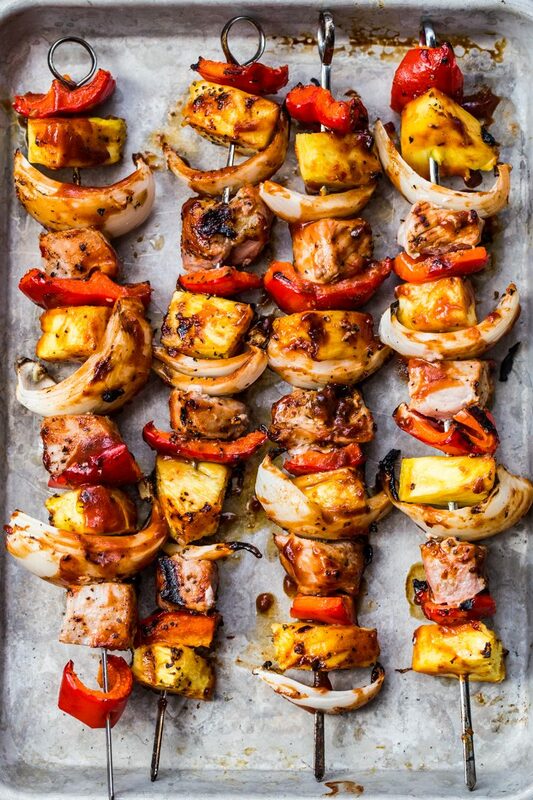 However you serve up these sweet and tangy pork kabobs, you’ll be happy. 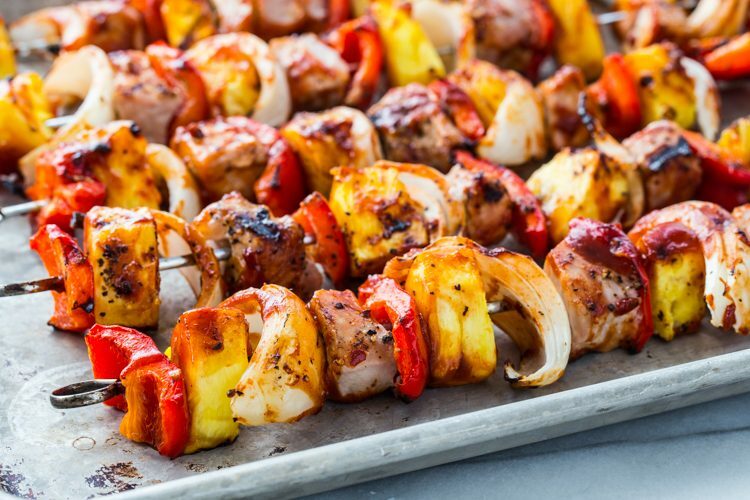 What kabob combinations does your family love? Skewer ingredients, alternating the pork, pineapple, peppers, and onions onto metal BBQ skewers. Sprinkle skewers with salt and pepper and brush with half of the BBQ sauce. Preheat grill to high heat for 10 minutes. Reduce temperature to medium/high and place skewers on grill, sauce side down. Brush remaining sauce onto skewers. Grill skewers for 5 minutes. Turn, and grill for an additional 5 minutes or until pork reaches an internal temperature of 145°F. 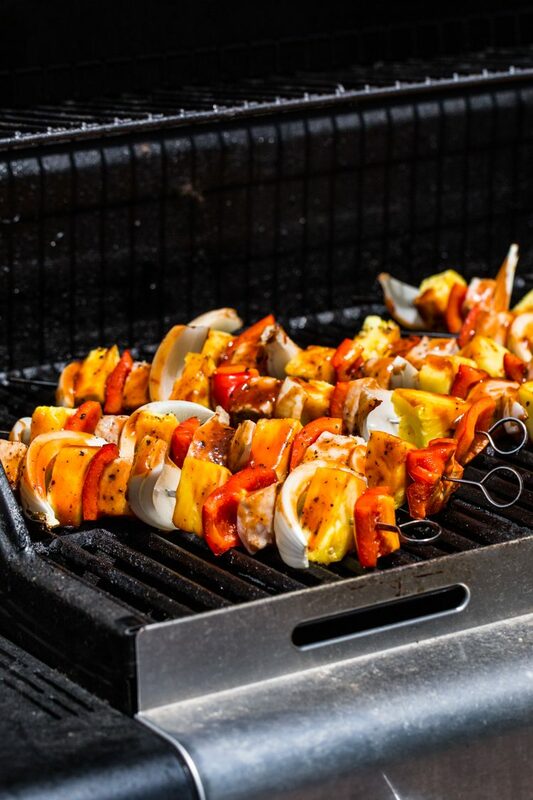 Remove from grill and allow skewers to rest for 3 minutes before serving. Serve grilled skewers on their own or over a bed of rice.